Bell and Howell Home Movie Maker 1945 Ad. 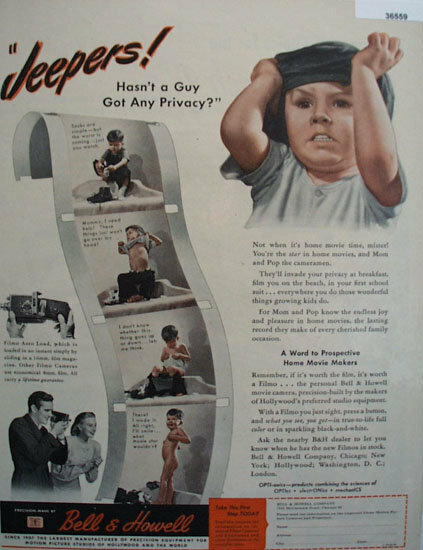 This color 1945 ad states Jeepers hasnt a Guy got any privacy. Not when its home movie time, mister. Youre the star in home movies, and Mom and Pop the cameramen. Picture shows film strips of boy pulling on shoes, pulling off shirt. pulling off pants and then naked. Magazine tear sheet picture is taken through plastic and may show wrinkles or crookedness that is not in the ad. This Original magazine tear sheet measures 10 inches wide by 13 1/4 inches tall. Items Similar To "Bell and Howell Home Movie Maker 1945 Ad"